Symmetry Table - poster paint, tape, and paper. Make a design on one side and fold paper. Post around event space with tape to allow for maximum drying. Remind the artist to take down their piece before leaving. Magnets Table - place an assortment of different metal and non-metal objects on the table along with different kinds of magnets (horseshoe, bar, marble, even lodestone) and have the visitors see which attracts and which doesn’t attract. Get your students to be in charge of the tables. Keep them after school. Feed them a pizza dinner! Explain what they are to do at each table and they can help you set up the tables and be the ‘table monitor’ all night. 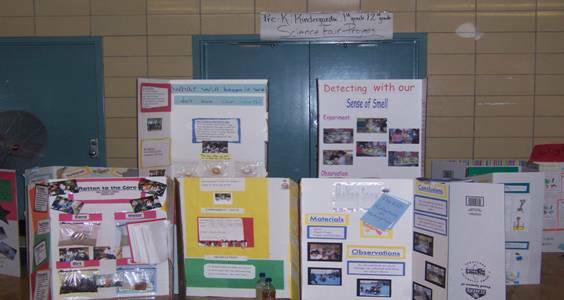 Presentation Podium/Long Table - A podium (or a microphone) and a long table are set up under a large sign in the center of the event space to allow students to present their science fair project. ANY student can sign up when they enter the event to present. I usually allow an hour to an hour of 2-3 minute presentations. It doesn’t matter if they won in their grade level or not. 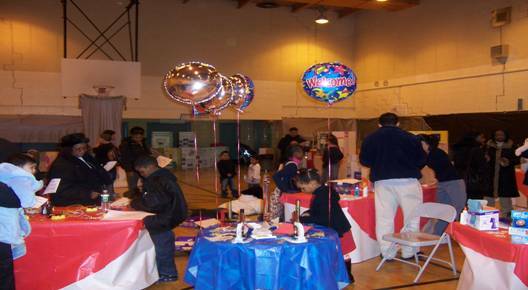 Its just time for the children to show off their hard work to their visiting families and for your children who love to talk to give an oral presentation. The project is placed up on the table and after a quick explanation (no need to read the entire board), they show how the display works/worked.